In NoMachine version 6, creating a multi-node environment is quick and simple. The only server accepting nodes in NoMachine v. 6 is NoMachine Enterprise Terminal Server, and the only node type accepted is NoMachine Terminal Server Node. Tip: the concept of 'foreign nodes' has been superseded by the concept of 'foreign servers'. It is now possible to create a multi-server environment with any server (except NoMachine free and Small Business Server), including servers without the NoMachine software installed (‘foreign servers’). They can be added to NoMachine Cloud Servers as explained here. Here is how you can add Terminal Server Nodes to Enterprise Terminal Server via the User Interface in just a couple of clicks. The steps below can also be applied when connecting to the Enterprise Terminal Server via web. 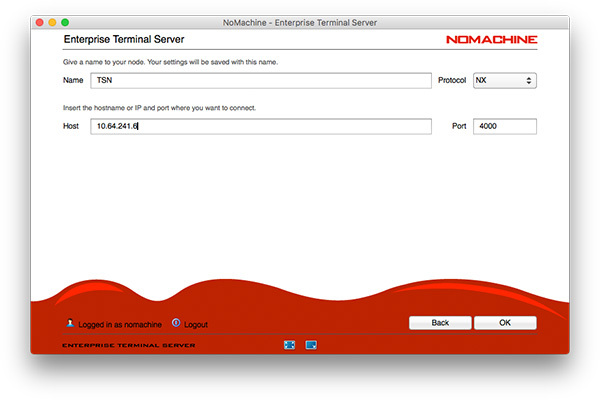 In order to trigger the 'add node' functionality you need to either be the system administrator of the host where NoMachine Enterprise Terminal Server is installed or be a NoMachine administrator. See the NoMachine Enterprise Terminal Server – Installation and Configuration Guide. Open the NoMachine User Interface in the usual way and connect to the Enterprise Terminal Server to which you want to add the node. Make sure you log in using your administrator account. The 'New node' button will be visible on the far right (Fig. 1). Click 'New node' (Fig. 1). Then click on the ‘Add node’ button at the top right of the page (Fig. 2). Provide a name for the node, fill in the IP address/host name details, and if appropriate set the protocol and port different from the default ones (Fig. 3). Click on OK to continue adding the node. 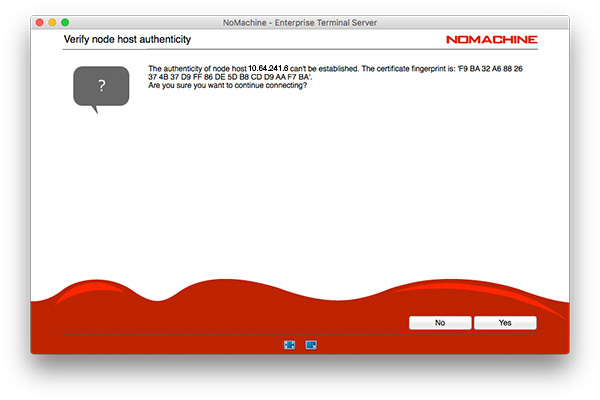 Accept the certificate fingerprint verification when prompted (Fig. 4). Authenticate to the remote node by using a privileged account on that node (Fig. 5). Wait a few seconds while the node is added. Once successfully added, you will see the node in the list of available nodes (Fig. 6). As you add more nodes to create your multi-node environment, the list of nodes will be populated. If you need to administer a node and can't see it in your list, use the 'Find a node' field to search for it (Fig. 6).